Over the past decade I’ve spent many hundreds of hours helping clients and colleagues find suitable translators to collaborate on their projects, mostly involving German and English, but occasionally venturing into other languages such as French, Spanish, Russian, Chinese or even Vietnamese and Sinhalese. Unfortunately, it can be said that “many are called [translators], but few… [should be] chosen.” For various reasons. Many clever translation buyers (translation agencies, corporations great and small, law offices, and individuals) know the open secret to finding a better class of translator: professional association directories. Sure, you can find rotten eggs in those nests too, but on the whole, these are far more serious professionals, most of whom actually make a living as translators and perform to standards that will enable to keep them doing so as long as they like. Not the desperate unemployed, the frustrated actors or journalists who can’t get enough work to pay the rent, starving studentZ or bored house hubbies. Where do you find contact lists for these professionals to find the “right” one with the special knowledge you need? Here. I’ll keep a running list of professional organizations around the world and links to their online directories. I know only a few myself, because my interests are limited to a few languages and countries; some of these have been kindly provided to me by international professional colleagues who know the organizations intimately and are in some cases involved with running some part of them. If you are looking for competent people, certified or otherwise, these are very good places to start your quest. It is more likely to have a happy end or a happy working relationship for the years ahead. Here there are links to the regional organizations and their directories (print or online). It’s a bit fragmented; the group in British Columbia, for example, has separate directories for “certified” and associate members. Too bad they can’t offer a nationwide directory in this modern age, but as they say, “seek and ye shall find”, and the findings are surely better than what one would typically turn up at a commercial portal without standards. BDÜ – home page (in English here). National scope. The site’s programming is primitive (still uses HTML frames!!! ), so the directory will have to be accessed from the home page. You can’t miss it though: a link with a big magnifying glass at the top of the page and large, bold words that say “search online for interpreters and translators“. The cream of the German crop will usually be found here. ADÜ Nord – home page (in German). More focused on the northern region. The online search form for translators is on the home page, impossible to miss. There are great language service providers to be found here. I am afraid more research should be done because this list is not complete. Where do you include Latín American countries, Argentina for example, which has a Federación Argentina de Traductores? Thank you for your comments. The Savvy Newcomer team acknowledges that this list is not complete; we have reblogged this post by Kevin Lossner and I believe his intent was to provide a sampling of the different associations that are available, not to offer an exhaustive list. I wish to enrol myself as a Japanese translator for a Japanese Translation company. Could you please include Japanese agaencies as well? This post was reblogged from another author’s blog and includes just a brief list of some translation and interpreting associations. 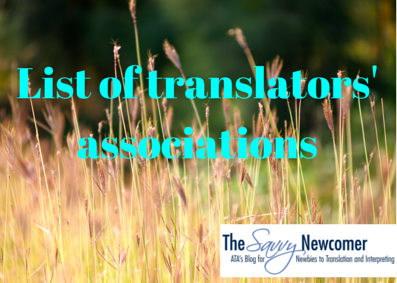 I encourage you to check out the original post at http://www.translationtribulations.com/2012/01/finding-good-translators.html and perhaps do some research and ask around about translation associations in Japan that could help you could get connected. How would you classify a person who, after a couple of decades in one profession in a foreign country, decided to make some changes and start with something new? 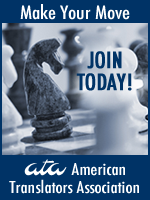 I recently joined the ATA and am happy to be listed in their directory. Without certification, or several more years of experience, I have little to no chance of getting onto my country’s best directories right now. What does one do in the meantime, if not align oneself with the “starving stundenZ” et al.? Thanks for your question. This article a reblog was originally posted by Kevin Lossner on TranslationTribulations.com, but I have a few thoughts in response to your question that I will share here. First off, I think that by joining ATA, listing yourself in their directory, and following The Savvy Newcomer, you’ve already begun to position yourself as a professional (as opposed to one of the casual amateurs Kevin lists who only picks up work when they feel like it). In line with this, I would encourage you to continue taking any steps you can to develop yourself as a professional translator and/or interpreter. This may involve creating a website that will help advertise your services, attending conferences in the field (whether ATA or other associations), honing your skills, sending your resume to potential clients, finding an internship or mentor program where you can learn more tricks of the trade, etc. You’ve classified yourself as a professional by making the move to switch careers; now it’s time to develop your skills and professional profile in order to take the leap and become someone that those best directories in your country would be proud to list.